Toil and Trouble: As the harvest kicks into high gear, migrant workers flood the area, some sleeping in cars or packing into small apartments. Every year they come as sure as the changing seasons. Migrant workers descend on the vineyards like a flock of birds, and when they have picked everything, they move on to parts unknown. They are a part of life in Napa County, and for as long as wine and tourism remain Napa's major industries, the availability of the migrant workers is something the community--or the local economy, anyway--will continue to depend on. However, while they are here, many of these men have nowhere to sleep. Some go to St. Helena Catholic Church, where from May through October there are 40 beds available for the workers. For $6 a night, they get a shower, a warm dinner, and a clean bed. "I've had no problems at all with the men," says Father John Brenkle. "I read in the paper that people don't want farmworker housing near them because they fear crime and other problems. These men aren't here for that. They are here to work. They are so exhausted at the end of the day, they just want to take a hot shower and go to bed." The church is one of several choices the farmworkers have for housing in Napa, none of which is exactly luxurious. Some rent apartments with four, five, or six other workers to make ends meet. Some take advantage of the farmworker camps, government-run, dormitory-style buildings that cost $11.50 a night. But since workers have to provide documentation to stay in the camps and often need credit or a rental history to get an apartment, many men have nowhere to go. Some go to the church. And others--no one knows how many--sleep out in the cold, alongside the river, under bridges or in cars. This year the church has seen fewer men than usual. There was an influx in April as men flooded into Napa County looking for work. 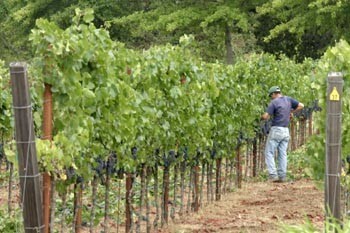 But the lagging economy and the grape glut, as well as factors like new mechanical innovations, have dried up the work. Many of the men left. At present, the church has around 20 workers, and the camps are only half full. But this is perhaps an anomaly, part of a temporary, cyclical low point. In years past, the church and the camps have had to turn away workers. Though Brenkle says that this year the need for basic housing is pretty much covered between the camps and the church, there is still a major need for affordable housing in Napa, and not only for the farmworkers. "We need more affordable housing, for service people and teachers and other workers too," he says. "It's a question of Napa County's very strict land use, which is mostly zoned for agricultural use. The county doesn't allow much housing." The affordable-housing problem has endured in Napa County for years. The issue carries over into Sonoma County, too, where recently workers faced a battle for 26 cots next to Sonoma's St. Leo's Catholic Church. Now six lawyers have filed a lawsuit against Napa County on behalf of two low-income plaintiffs demanding that Napa start fixing the affordable-housing situation. The complaint threatens Napa's slow-growth policies and may force the county to revamp its agricultural-based zoning. The lawsuit also has the potential of stopping development and changing the landscape of Napa County forever. The lawsuit against Napa County, which has been expected and feared by some for years, was filed in Napa Superior Court in early August. Six attorneys from Santa Rosa, Sebastopol, Marysville, and Oakland brought the complaint on behalf of two low-income plaintiffs, Hector Olvera and Jorge DeHaro. It is headed by California Rural Legal Assistance, the California Affordable Housing Law Project, and two private affordable-housing attorneys. The private attorneys, Neil Herring and David Grabill, have led affordable-housing cases against Sonoma County, Healdsburg, and Rohnert Park, among others. Grabill was a lead affordable-housing attorney for the Laguna Vista housing project in Sebastopol, a case that pitted environmentalists wanting to protect precious land against affordable-housing proponents wanting to expand housing options in an emotional and drawn-out battle. The lawsuit against Napa County takes a blunt stance, saying that there is a "severe shortage" of affordable housing in Napa County, and that the county has made no attempt to remedy the situation. It says Napa County is in violation of state law, has failed in its duties, and, if not enforced by the court, "will continue to refuse to perform said duties and continue to violate the law, and plaintiffs and other very-low- and low-income persons will be injured as a result." According to the complaint, the lack of affordable housing has an impact on people protected under the California Fair Employment and Housing Act, which makes it illegal to discriminate through public-land-use practices against people of race, color, religion, familial status, and other factors. "What we want from Napa County is to first and foremost identify its housing needs," says Nancy Palandati, a lawyer with CRLA. "It's appropriate for a community to identify sites for affordable housing. Napa County hasn't even started the planning process." Napa County has never adopted a housing element, a five-year plan appended to the county's general plan that is designed to meet the community's housing needs. The housing element is required by law and is supposed to be approved by the state of California. When a community neglects to adopt a housing element, the law is not heavily enforced. There are no fines or penalties. It just leaves the community wide open for lawsuits. "Not having a housing element leaves Napa in glaring default," says Herring. "And the problems for lower-income people in Napa because of it are very obvious." The lawsuit requires Napa County to develop a housing element to ensure, in part, that some land be put aside for affordable housing. In addition, the lawsuit wants the county to remove governmental barriers and fees for affordable-housing projects. Napa did submit a housing element in December 2001 to the California Department of Housing and Community Development. It was rejected because of Napa's slow-growth policies. "The state rejected the housing element because of our local policies that restrict growth to 1 percent per year," says Howard Siegel, housing specialist for Napa County. "There was no way to adopt a housing element without undoing the local policy initiated by the voters." With such restrictions in place, land in Napa is getting scarce. Only about a hundred permits are issued a year, and they tend to go to high-end projects. To make things worse, strict zoning laws keep multifamily buildings out of the agricultural zones that make up most of the county. Without protection for affordable-housing projects, the wealthy high-end plans usually win the permits, according to Herring. Without the protection of designated affordable-housing sites and the removal of some of the government constraints, affordable-housing projects don't have a fighting chance. For example, recently the Napa County Housing Authority tried to develop some land for affordable housing, but government red tape and zoning laws stopped the project dead in its tracks. The land went to a new winery for golfer Johnny Miller. Palandati believes that the Miller winery situation is symbolic of what's wrong with Napa's housing laws. "The county says it has no more land left, but in the meantime, big wineries are being built and expanded, and big tourist attractions like resorts are being built and expanded," she says. "If that can happen, why can't there be affordable housing being built and expanded, too?" Since the lawsuit was filed, Napa County has begun to look at where it might add more affordable housing. It has been in negotiations with American Canyon and the city of Napa to take on some of their affordable housing in exchange for other financial favors. If the cities take on some of the affordable housing, it would preserve the county's agricultural zoning and keep housing in an urban area. Though they are watching warily, the lawyers in the lawsuit seem to view this development as a positive first step. "In principle, we don't disagree with locating affordable housing in an urban area," says Herring. "It's not our position that affordable housing has to be out where the vineyards are. We agree with the county that it makes sense to locate the housing within an urban area, as long as it doesn't diminish the city's capacity for meeting their own low-income housing." Though most people benefit from affordable housing, the lawsuit focuses on low- and very-low-income people, "particularly farmworkers and their families," because they are the group the most hurt by the lack of housing. Very-low-income households have an income of up to 50 percent of the area median income; low-income households have between 50 percent and 80 percent of the area median income. A family of four making $33,800 can afford only $845 for rent, while rent for a two-bedroom apartment in Napa County hovers around $1,400. In fact, according to the suit, 84 percent of the dwellings in Napa County are only affordable to people with moderate incomes or higher. Before filing the complaint, CRLA tried to work with the county to improve housing for the farmworkers, but they were not well-received. "We were not welcomed, and that's putting it mildly," says Palandati. "There was an animosity there because we were seen as coming from outside the county. We were told, 'These are our people, and you don't have anything to do with it.'" The plaintiffs in the case, Hector Olvera and Jorge DeHaro, were chosen because they are representative of the low-income group. Olvera has been working in Napa County for 12 years as a gardener, farmworker, and in other odd jobs. He is affiliated with Latinos Unidos de Napa, or LUNA, an unincorporated group of Hispanic Napa residents. Though he personally has had trouble renting in Napa County, his work with LUNA has also allowed him to see firsthand the trouble other workers have had trying to find housing. "There are many apartment complexes where people live in overcrowded conditions because we can't afford more," Olvera says through a translator. "I have seen cases where families have to live apart because their finances don't allow them to live together. There are various people living along the river and in cars." The complaint against Napa County cites similar conditions. Many workers commute long distances from Lake and Solano counties to work in Napa. And economic conditions keep them from their families. "Many farmworkers are forced by the Napa housing shortage to stay in bunkhouses and leave their families in some other areas, often hundreds of miles away," says the complaint. Perhaps most disturbing of all this is the undefined number of homeless workers. The fact that there are homeless workers is a problem that everyone acknowledges. But just how big that problem is remains a matter of whom you believe. "There is a gap in housing that we need to address," says Siegel. "How big that gap is depends on what source you go by. However, it's safe to say that during the harvest season there are several hundred people in need of a bed." In 2001, Napa County commissioned UC Davis agricultural economics professor Phillip Martin to do a study on farmworker housing conditions. He sent surveys to 1,200 members of the Napa County Farm Bureau and 270 vintners. He also interviewed 72 farmworkers. The study found that in 2001, more farmworkers were employed for more months in Napa County, and that in the late 1990s, the number of inspected beds fell 40 percent, from 400 to 250. It also said that between 400 and 600 people have "irregular housing," which includes sleeping at the St. Helena Catholic Church, camping under bridges, and sleeping in cars. But many say Martin's numbers are much too low. A September 2001 study by Alice Larson of the U.S. Department of Health and Human Services estimates that there are 9,500 farmworkers in Napa County, 4,400 migrant workers, and 5,100 seasonal workers (permanent residents who work seasonal jobs). Larson studied databases from the Department of Labor and the Association of Farmworker Opportunity Programs, among others. Based on that, the complaint estimates that there are "between 500 and 1,000" homeless workers in Napa County. Martin, however, says there's no proof the numbers are that high. "I've heard the figure that there are close to 10,000 farmworkers in Napa County, but no one has produced any numbers proving that," he says. "There's absolutely no evidence there are that many farmworkers in the county." Last year, voters passed a measure to add 300 new beds for homeless farmworkers, based on Martin's study. In June, a new camp added 40 beds and another camp of 60 beds is in the early planning stages. Vintners Joseph Phelps and John Shafer donated the land for the camps. Together, the camps will add 100 new county-sponsored beds, though they are only available to workers who can provide documentation. Martin's study had other suggestions for dealing with the irregular housing problem beyond the addition of 300 beds. He suggested the camps more tightly verify all worker documentation, citing figures from the Department of Labor that said 55 percent of crop workers are unauthorized to work in the United States. Martin also recommended raising the price of the camps from $11.50 a day to $18, or $540 a month, so that demand would no longer exceed supply. He suggested that farmworkers could save more money if they doubled the number of occupants in an apartment. And, he added, the situation would benefit if there were fewer cheap or free housing options, like the 40 beds at St. Helena Catholic Church. "You'll never eliminate the number of homeless people as long as there are free options available," he says. "If there is an option to live for no charge, some people will want to do it. People are rational. If a person's motive is to make as much money as possible, he will elect to stay for free if the option is available to him." Still, others maintain that most workers would rather not be homeless, with few of life's basic necessities, like a shower, bed, and roof over their heads. "It is sad to see people sleeping along the river and in cars because the rent is so high," says Olvera. "I would be very happy that we would be able to get an apartment and that people don't have to sleep near the river or in their cars. I would like people to live happily and equally and be able to afford an apartment with the salaries they have. There are many people that dream of buying a house, but for the poor, the dream is renting an apartment for their family, that they don't have to share, that they can live in with dignity." Translation services for this article provided by California Rural Legal Assistance. From the August 28-September 3, 2003 issue of the North Bay Bohemian.